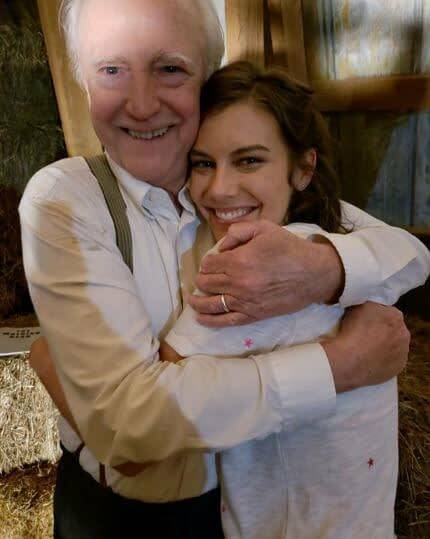 Fans of AMC‘s The Walking Dead learned of the passing of actor Scott Wilson (Hershel Greene) on Saturday night, less than an hour after it was announced at the show’s New York Comic Con (NYCC) panel that the actor would be returning for Andrew Lincoln’s (Rick Grimes) final season – and possibly as a voice of reason for Lauren Cohan‘s Maggie Greene. Now, Cohan is sharing a photo memory of herself with her on-screen father to Instagram – a simple yet heartbreaking reminder of how close the actors were. Wilson’s Hershel was seen by many fans as the heart and soul of the series, and was one of Rick’s most closest friends and confidants over the seasons before being killed at the hands of The Governor (David Morrissey) and his sword. His name lives on in the ninth season, as we learn that Maggie and Glenn’s (Steven Yeun) son has been named after him. New showrunner Angela Kang announced Saturday night that Wilson would be joining Sonequa Martin-Green (Sasha) and Jon Bernthal (Shane) as guest stars this season, with the late actor having completed filming.